SCHAGHTICOKE — They’ve raised more than $150,000 on their quest to protect their farm, and now Brian and Justine Denison are asking for your support to make their dream a reality. 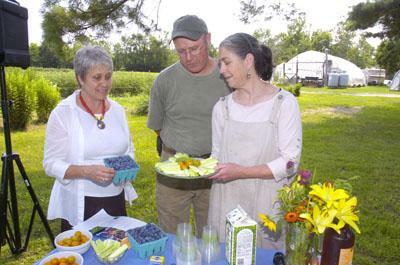 The Denisons are the owners of Denison Farm, a 164-acre piece of land off Buttermilk Falls Road that yields food for 510 households throughout the region — including the governor’s mansion — through its community supported agriculture, or CSA, program. Since purchasing the property in 2005, the couple has developed the CSA operation established in 1988 into the thriving business it is today, growing more than 80 varieties of vegetables that go to residents, restaurants and farmers markets. Wanting to preserve the farm’s place in the community, the Denisons approached the Agricultural Stewardship Society, a land trust organization, about obtaining a conservational easement for their property, which would bar any development on the land unrelated to farming. The easement will not only preserve their farm’s footprint, but also make sure it is available and affordable for future farmers. When one factors in the appraisal, survey work and staff time, the easement costs more than $173,000, most of which the Denisons have raised through federal and organizational grants, donations from their CSA members and their own money. Now, they’re asking the public to help them foot the rest of the bill, launching a campaign to raise the remaining $15,000 for the easement during an announcement at the farm Tuesday. That deep community connection goes hand in hand with the national push to eat local and understand where one’s food comes from, Ptacek said. One large contributing factor to the Denisons’ decision to pursue the easement came with the development of the GlobalFoundries plant in Malta, about 16 miles away from the farm. With the push to capitalize on that new business, and the opportunities for the region that come with it, the Denisons worried that their land would eventually become just another slice and dice prospect for a housing developer looking to profit from its location. Assemblyman Steve McLaughlin, R-Melrose, said it was imperative to protect farms in Schaghticoke, Mechanicville and Malta that may feel threatened thanks to GlobalFoundries’ success. Noting that that pressure would most likely wipe out most or all of Schaghticoke’s farms were it not for the work of the ASA, the Denisons said they were thrilled to see theirs live on. To make a donation to protect Denison Farm, visit www.agstewardship.org. Katie Nowak can be reached at 270-1287, by email at [email protected] or on Twitter @knowak_record.